PopEntertainment.com > Reviews > Record Reviews > Those Darn Acordions! 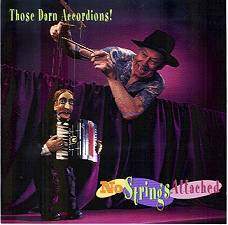 I'm not sure why they sent me a disk by a band that features six lead accordion players. I suppose because I tend to be more open-minded to quirkiness than some other writers. Well, with that in mind, I suppose Those Darn Accordions have a certain kitschy charm. And if you play it long and loud, I'm sure you'll get rid of unwanted houseguests.